There was no mention of President Donald Trump, whose full-throated endorsement provided the political momentum that lifted the former congressman into the state’s highest executive post. But DeSantis, a Harvard-educated lawyer and U.S. Navy veteran, praised outgoing Gov. Rick Scott, who won a U.S. Senate seat in November, for leaving “a strong foundation,” including a growing economy. 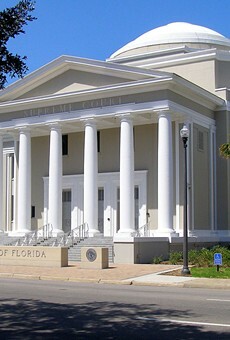 “It now falls to me to build upon the foundation that has been laid, navigate the challenges —- economic, environmental, constitutional —- that lie ahead, and steer Florida to a stronger, cleaner and safer future,” DeSantis told a crowd of more than 2,000 supporters, lawmakers and state officials who gathered on the east side of the Old Capitol building for the ceremony. Following a campaign promise, DeSantis is also expected to quickly announce a plan to deal with water-quality problems that have included an outbreak of toxic algae in some rivers and red tide along state coastlines. He said water quality is “foundational” to the state’s prosperity. “Let’s promote a virtuous cycle whereby low taxes, a reasonable regulatory climate, a sensible legal system and a healthy environment attract jobs, business and investment —- particularly in the areas of technology, manufacturing and finance,” he said. On schools, DeSantis said he would support the creation of more education “opportunities,” a reference to the likely expansion of charter schools, publicly funded scholarships for private-school students and other “choice” programs. “One size does not fit all. 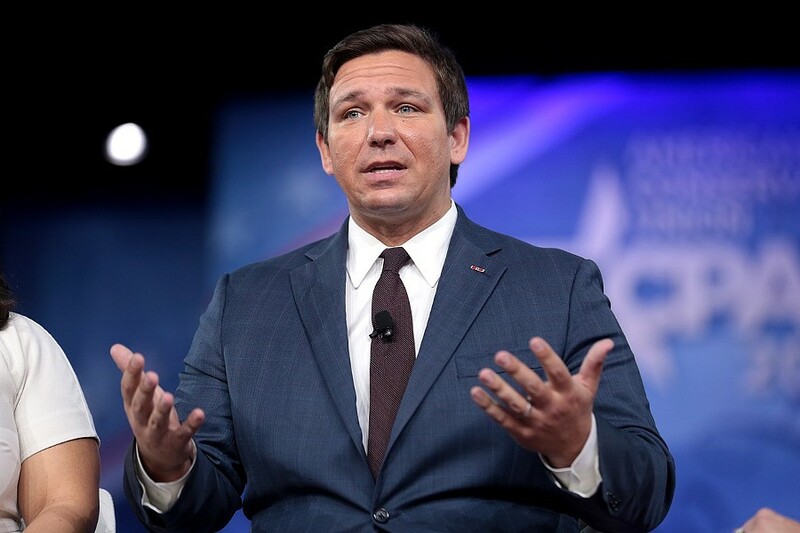 No family should be denied the opportunity for their child to succeed due to insufficient income or to living in the wrong ZIP code,” DeSantis said. He also reiterated a campaign pledge to improve civics education in Florida schools. In a more partisan vein, DeSantis said he would not allow any “sanctuary cities,” which do not currently exist in Florida. “And we will stop incentivizing illegal immigration, which is unfair to our legal immigrants, promotes lawlessness and reduces wages for our blue-collar workers,” he said. DeSantis also promised to improve Florida’s reputation for conducting elections, saying the state should not be “further tarnished by the repeated failure of a small number of counties” to properly conduct elections. “A generation of botched elections is enough,” he said. DeSantis said he would remove officials if they are “neglectful of required duties.” That could include suspending Broward County Sheriff Scott Israel, who has been criticized for the performance of his agency during the mass shooting at Marjory Stoneman Douglas High School last year. DeSantis and his lieutenant governor, former state Rep. Jeanette Nuñez, R-Miami, participated in the traditional swearing-in ceremony shortly before noon Tuesday. But both actually took office just after midnight Monday, having filed their official oaths of office in December with the Secretary of State’s Office. Nuñez, who succeeds Lt. Gov. Carlos Lopez-Cantera, became the highest-ranking Hispanic woman in state history with her new post. 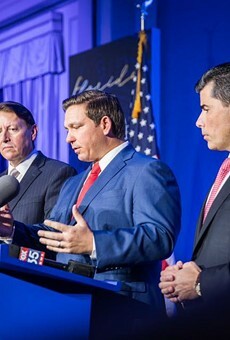 On Tuesday, DeSantis and Nuñez also continued establishing a cordial relationship with the Republican-led Legislature, hosting a luncheon in the Capitol with the 40 state senators and 120 House members after the inauguration ceremony. 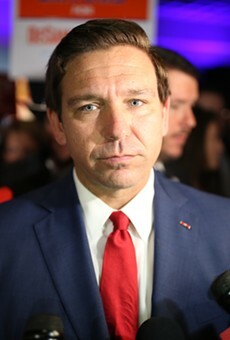 DeSantis repeated his philosophy about the importance of the Legislature in the government process. “I’m somebody who thinks our government is better when the legislative branch is exercising the authority that it was granted under the Constitution. 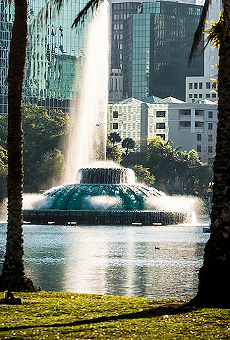 I think that is true in the federal government and I think that is true here,” DeSantis said, drawing applause from the lawmakers. 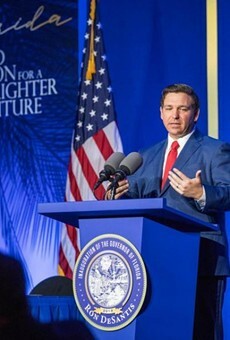 DeSantis was accompanied by his wife, Casey Black DeSantis, at the inaugural ceremony and at the legislative luncheon. 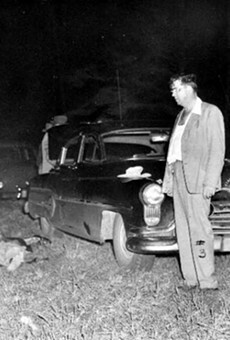 The couple were also scheduled to host an inaugural ball Tuesday night. State records show DeSantis is Florida’s youngest governor on Inauguration Day since Park Trammell took the oath of office on Jan. 7, 1913, as a 36-year-old former attorney general.